MARK 10:27 KJV "And Jesus looking upon them saith, With men [it is] impossible, but not with God: for with God all things are possible." 24And the disciples were astonished at his words. But Jesus answereth again, and saith unto them, Children, how hard is it for them that trust in riches to enter into the kingdom of God! 25It is easier for a camel to go through the eye of a needle, than for a rich man to enter into the kingdom of God. 26And they were astonished out of measure, saying among themselves, Who then can be saved? 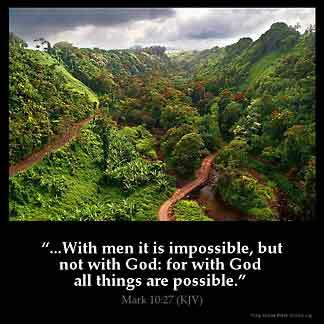 27And Jesus looking upon them saith, With men it is impossible, but not with God: for with God all things are possible. 28Then Peter began to say unto him, Lo, we have left all, and have followed thee. 29And Jesus answered and said, Verily I say unto you, There is no man that hath left house, or brethren, or sisters, or father, or mother, or wife, or children, or lands, for my sake, and the gospel's, 30But he shall receive an hundredfold now in this time, houses, and brethren, and sisters, and mothers, and children, and lands, with persecutions; and in the world to come eternal life. And Iesus looking vpon them, saith, With men it is impossible, but not with God: for with God all things are possible. Looking at them, Jesus *said, "With people it is impossible, but not with God; for all things are possible with God." Jesus, looking on them, said, With men it is impossible, but not with God: for all things are possible with God. And Jesus looking upon them, saith, With men it is impossible, but not with God: for with God all things are possible. Jesus looking on them said, "With men it is impossible, but not with God; for everything is possible with God." And Jhesus bihelde hem, and seide, Anentis men it is impossible, but not anentis God; for alle thingis ben possible anentis God. Mark 10: 27, want us Christians to believe in God not in man. God word should be in us at all time. He is the live the truth and the lights. about mark. GOD IS ABOVE ALL THINGS WITH HIM ALL THINGS IT DEPEND ON GOD. God knows all things. There is nothing hidden from him. So, what man thinks it is impossible, with God all is possible because is thought and his ways are higher than our. His knowledge, wisdom and understanding is unlimited unlike us. So,there is nothing difficult for him to do. God's WORD, is the TRUTH, And the Light, HE Is The ALFA and The omega, WE CAN DO ALL things through CHRIST who strenghtens US, WE can't do it alone!!!!! !